Dr. McAbee is a licensed clinical psychologist in the states of Louisiana and Alabama. His training background is in both clinical and counseling psychology with an emphasis in health psychology and behavioral medicine. He has experience working with a variety of conditions and concerns, as well as diverse patient populations and treatment settings. Dr. McAbee has worked in community outpatient clinics, oncology centers, solid organ transplant centers, department of veteran’s affairs, and college counseling centers. In addition to broad based psychological evaluations and treatment, he is fellowship trained and specializes in the assessment and treatment of chronic pain. Dr. McAbee received his doctoral degree from the University of South Alabama, completed his doctoral internship at Tulane University School of Medicine and was fellowship trained at the Southeast Louisiana Veterans Health Care System (all APA-accredited programs). 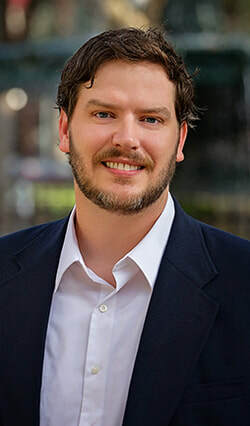 In addition to his clinical practice, Dr. McAbee is a Clinical Instructor of Psychiatry and Behavioral Sciences at Tulane University School of Medicine and also serves on the board of directors for the Southern Pain Society. Dr. McAbee maintains professional affiliations with regional and national organizations. He has authored publications in peer reviewed journals and edited book chapters, as well as presented his research at regional and national conferences. Dr. McAbee has also been an invited speaker for various events and organizations. © Copyright Jefferson Neurobehavioral Group, LLC All rights reserved.